While riding the highways and byways of the hypertext stream (oh grief, please don’t ever let me use that sentence again) I recently encountered two unique Space-themed titles of a more exploratory and scientific kind than many of us are used to. As an intrepid explorer myself (I occasionally drive to Wales), I was very interested to delve into them. For anyone with the desire to become the next pulp-scifi space captain (and possessing the rudimentary minimum imagination necessary to read a book), Space Exploration : Serpens Sector is a work-in-progress worth a look. 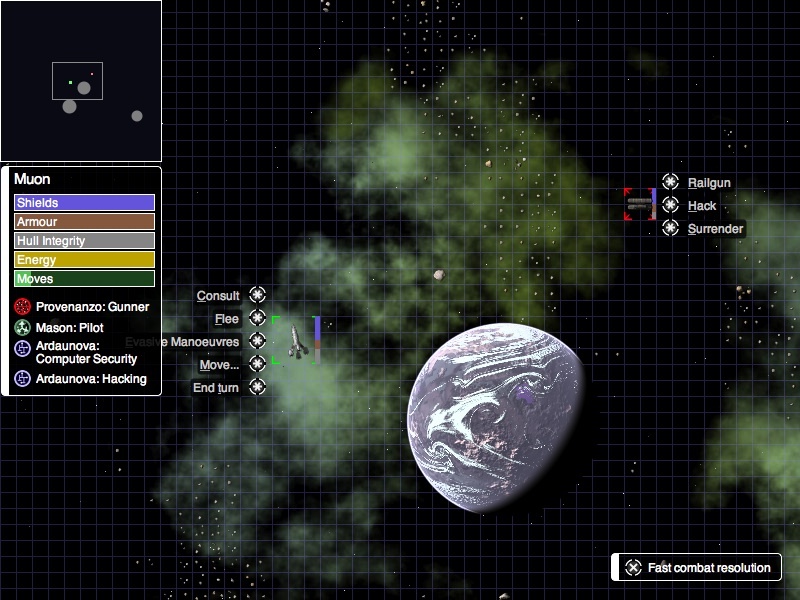 Fundamentally, the game focuses on a top-down view of an area of star systems which you can visit with a simple click. However, each journey costs fuel to get there (and of course, to get back). Fortunately, your friends at the home station are on hand to reward your exploring efforts with more fuel, so it forms a principle resource. All this would be pretty dull were it not for the fact that every new star system holds something different; contact with new races, hanging out in bars on asteroids, having your crew abducted… every voyage plays out like an episode of Star Trek. Of course, with this incredible scope these encounters are text-based, but as stated earlier this gives it quite a literary feel and the entirely random universe varies well. Additionally, battles are fought out using a detailed (if sometimes ponderous) combat engine of a similar look and feel to the galactic map. A nice touch is that you can ask your crew for advice in battle, advice that is actually worth listening to. The version I played was the tenth, and current, build, which seemed very stable and gave no problems. And unlike many indie developers that feel cornered into using awful DRM in their games, Metal Beetle have stated the game will be free; only the content-adding expansions will cost anything. Read more about that here. Orbiter is 100% a simulator. One way to tell this is that I have only really been able to figure out how to pitch, bank and yaw. After connecting a joystick I discovered I could throttle the forward thrusters. Yet it had me spinning in orbit for half an hour, fascinated, attempting to try this and that to see just how easy it is to knock a shuttle out of orbit. I was expecting the slightest goof to send me plummeting toward the big blue thing, but here it would seem it’s almost as hard to hit a planet as it is to miss it; several times I found myself accelerating away from Earth accidentally at ridiculous speeds. This is the nature of orbits, although one always wonders what is accurate and what isn’t in a simulator: especially when my triumphal crash into the pacific ocean actually made me bounce a kilometre back up into the air. Orbiter is a geek’s toy, no doubt about that. But it does come with a plethora of preset scenarios and recorded sessions to help you see it all without having to first attain a Masters in astrophysics. 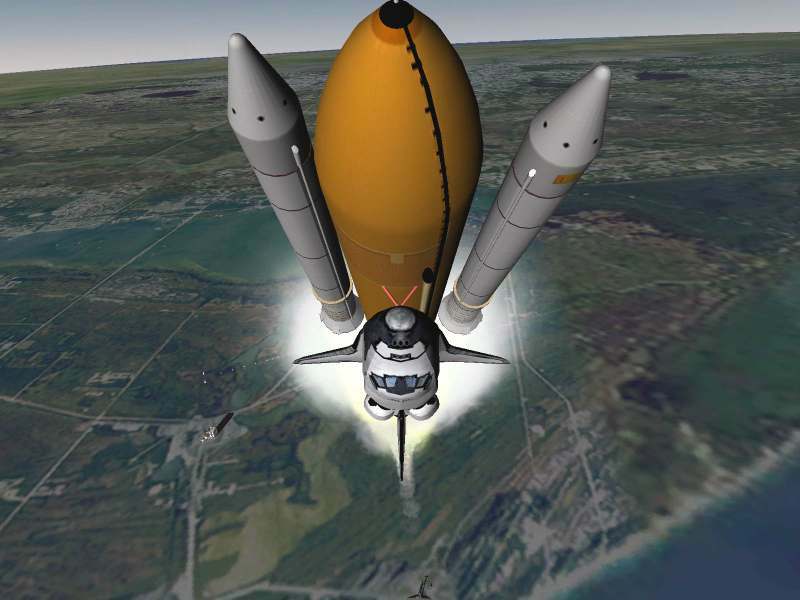 You can watch the shuttle launch in the skilled hands of an expert, which gives you an idea of the scale and speed of the real thing. Many other situations and some very fine graphics (for the most part) make it an educational, often enjoyable indulgence; especially for space nerds like me that could reel off all the planets and moons from the age of five. My only real gripe was the lack of sound, even in the atmosphere (but as you’re mostly in space this isn’t a biggie). The lack of planetary detail beyond Cape Kennedy is a shame too, but an understandable limitation. I would have liked to have seen better simulation of impact with the ocean/land at 100 metres per second, but I guess they aren’t supposed to show shuttles disintegrating in a game of this nature. Overall, both of these are labours of love and definitely niche programs, but it is refreshing to see an experience you just can’t find elsewhere!